The T Rex Skeleton Model has a bone to pick with all would be paleontologists. At 36 inches long this T Rex model is large, but fortunately not the full-sized 20 foot high and 40 foot long version. 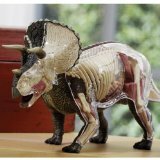 Not just a dinosaur toy, this scale model is close to museum quality. You can take it apart and put it back together like a puzzle or you can use this formidable T Rex Skeleton as a display piece. 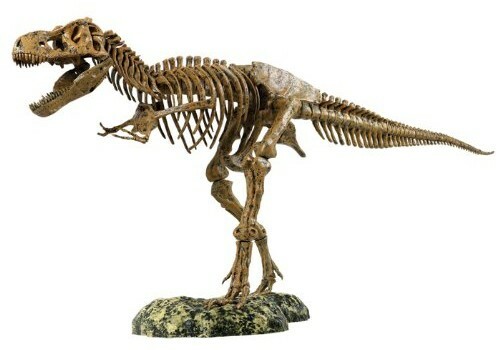 This 3-foot T Rex skeleton model has 51 bone-like pieces that snap together much like a puzzle. No model cement is needed to assemble your T Rex. You can display it on its rock-like base or take it apart to build again later. Your Tyrannosaurus Rex Skeleton comes with an educational color poster full of fun T-Rex facts. 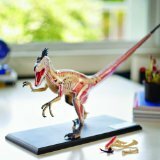 This T Rex Skeleton makes the perfect gift for dinosaur lovers and future budding Paleontologists. This thing is awesome. Definitely not a kids toy. I bought it for my wife who loves dinosaurs and it looks great next to the velociraptor skull model that cost 3 times as much. Mine however came with 2 left arms, and after emailing Elenco, a right arm arrived in the mail less than a week later. This is a great product backed by excellent customer service. I just wish they made other dino models of this caliber. Very realistic looking and easy to assemble. My nephew loved it.